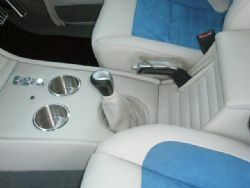 Another major milestone has been achieved with the interior now finished by Duncan and Dave. 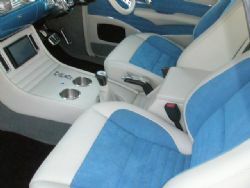 The guys have done an outstanding job and not only does it look the goods it is super comfortable as well. The last few items were wrapped up without drama. 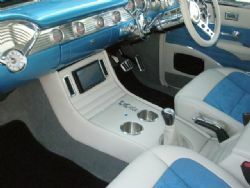 The front console was finished with carpet down the sides and the rear seat pockets were stitched up and installed. 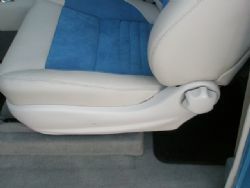 The plastic covers on the side of the seats were sprayed to match the interior and the foam on the drivers seat was massaged to allow appropriate clearance from the armrest mounted on the door panel. Dave hooked up the washers and got them working before it left the trim shop and I spent half a day running around to get additional plumbing for the vintage air system to allow it to be routed around the stereo in the centre console. Duncan checked the air, stereo and reversing camera to ensure it all worked prior to leaving the shop and Dave cleaned the car of many months worth of dust so it can head off to Procar looking resplendent. It was always a pleasure to pop in and see the car at the trimmers and the guys there always made you feel welcome. It would be remiss of me not to mention Billy who was always firing up the jug and making a cuppa each timed I graced them with my presence. The pictures tell the story and I cant wait get it on the road and enjoy the sumptuous interior and driving the wheels off it. The nomad is currently sitting at Procar and a little fine-tuning is being done on various aspects of the car. Everything comes to light when you drive it and I had the opportunity to take it for a test spin around the block and Paul drove it down to Brookvale to have the wheels aligned. When we returned I noticed smoke coming from under the hood, clearly not a good sign. On inspection a major drama was unravelling in front of us. The smoke had an acidic smell and appeared to be coming from the battery. The leads were super hot so it quickly got disconnected and doused with water. Somewhere there was a major short and it was not looking good. It looked expensive and I had ugly thoughts that the interior may need to come out and it could take days to find the cause of the problem. Because all the fuses were good it had to have something to do with the starter motor. On inspection the main lead from the starter that was bent over the top of the unit had rubbed and worn in a hole in the lead. This allowed the lead to short and fuse itself onto the starter. The net result was the battery totally fried itself and thankfully we got to it before there was any other damage done. There are a couple of squeaks to sort out, a power steering hose knuckle needs to be relocated and the brakes need a little attention before it goes to Joscar for a final buff and clean before the engineer. Things are happening. Watch this space….